Yu is developing a metabolic photosynthesis model of soybean for the Crops in silico project. 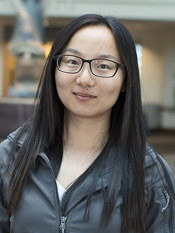 She received her bachelor’s degree in biotechnology from the University of Science and Technology of China and then went on to earn her doctorate in computational biology from the CAS-MPG partner institute for computational biology, CAS, China. She is a Postdoctoral Research Associate at the Carl R Woese Institute for Genomic Biology.